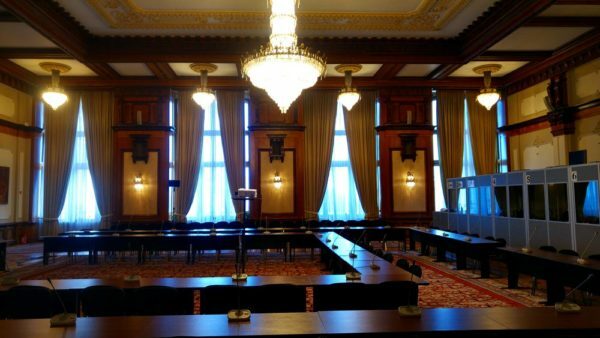 The mammoth building – Palace of Parliament in Bucharest – is one of the must see attractions in the city. However, I had never visited the place until now. And when I did, I did so in great company. Regular readers of this blog certainly noticed Kemkem from Nextbiteoflife in the comment section here. We have connected online a loong time ago and we both enjoy reading each other’s blogs. 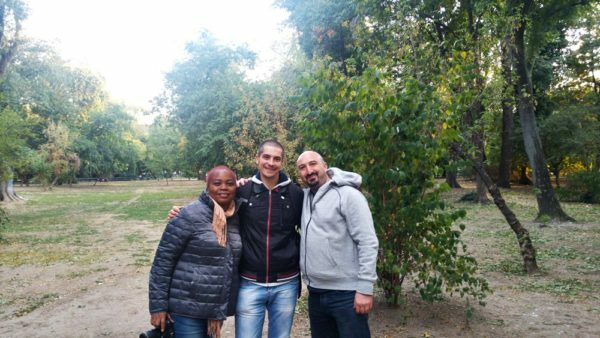 Therefore, when she told me that she was going to visit Bucharest in late September, I decided to visit Bucharest too and meet her and Federico, her husband. A great gift for me, too, since on September 30th I celebrated my 33rd birthday too! They are both amazing people and I absolutely loved the couple of days we’ve spent together. Everything looks and feels a lot better when you are in good company and, at least in my case, it was a perfect and much deserved break. Meeting fellow bloggers and amazing people like Kemkem and Federico truly recharges your batteries and fills you up with energy. And, as today’s article proves it, helps you see new things. 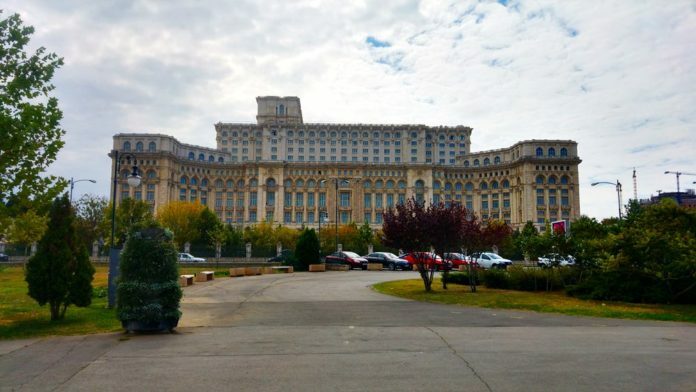 Like the Palace of Parliament, the second largest administrative building in the world (after the Pentagon) and a mammoth of a building that Romania’s former dictator, Nicolae Ceausescu, decided to build for himself. He never got a chance to actually live there because the revolution happened. 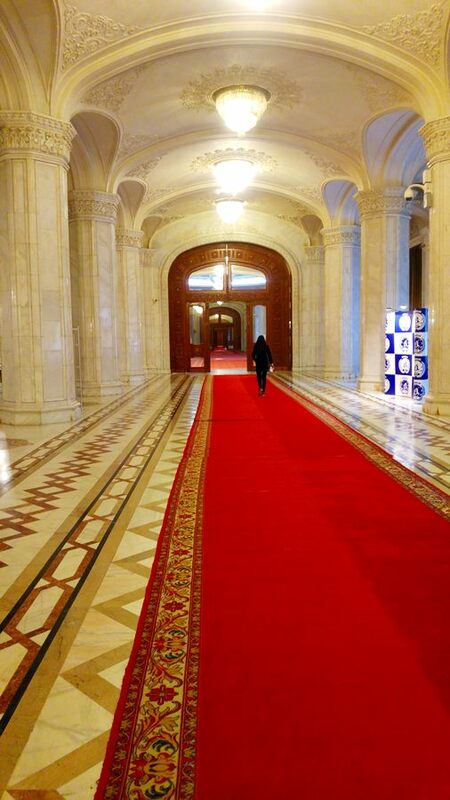 Now, the huge building houses Romania’s parliament, plus a ton of usually empty, yet still impressive rooms. The tour we booked was a limited one since a NATO conference was about to begin in a couple of days and many of the places normally included in the tour were off limits. We still spent around one hour exploring the building – and at the end we were told that we only saw 3% of it. This means that this building is so large that 24 hours are not enough to see it entirely. Pretty amazing, I’d say! Before visiting, I was sure that the building is nothing but a cold, empty mammoth that only impresses because of its sheer size. But the truth is that – at least the places we visited – are built with a lot of attention paid to detail and impressive on their own. The first hallway paints a solid picture of what’s about to follow: truly impressive stuff! A mammoth building needs a mammoth chandelier. This is the biggest in the Palace of Parliament, weighting 2 tons. Yes, it was HUGE! This looks like and endless hallway. There you go in terms of morning exercise! One of the conference rooms with translation booths to the right and a secret door (not pictured) to the left. This beautiful staircase looks like the perfect place to shoot some great wedding photos. They were built, destroyed and rebuilt a few times until they were perfect for the leader: he was a short man and wanted the stairs to be of a lower height in order for him to easily climb them. Most of the art there is really impressive too! 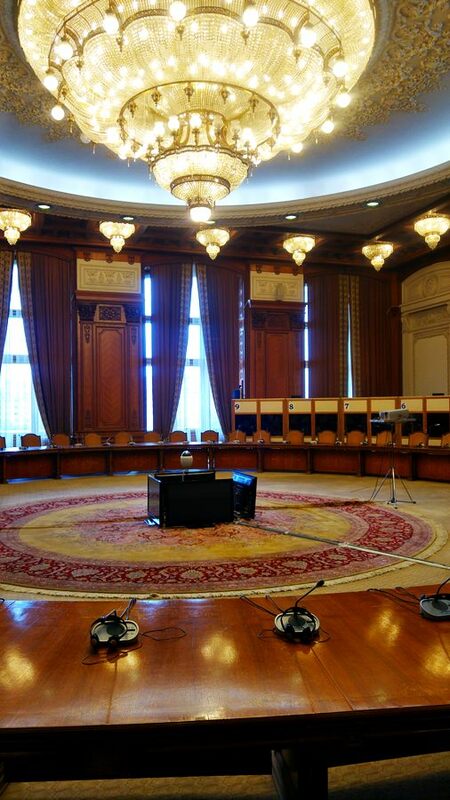 Another impressive room, reserved for some of the most important meetings in the area. The only round table in the room. The carpet on the floor mirrors the pattern around the chandelier above. Imagine how much work was required to complete all these details! A beautiful view from one of the balconies. I can only imagine how nice the panorama would look like from even higher! This is clearly one must see attraction if you happen to be in Bucharest, but booking is not extremely easy. You have to book a tour 24 hours before your visit, and you can only do it by phone. Simply popping there without a reservation isn’t going to work. There are six different tours you can take including more or fewer rooms and areas and I would recommend the 4th option: Standard Tour + City’s panorama and Terrace. 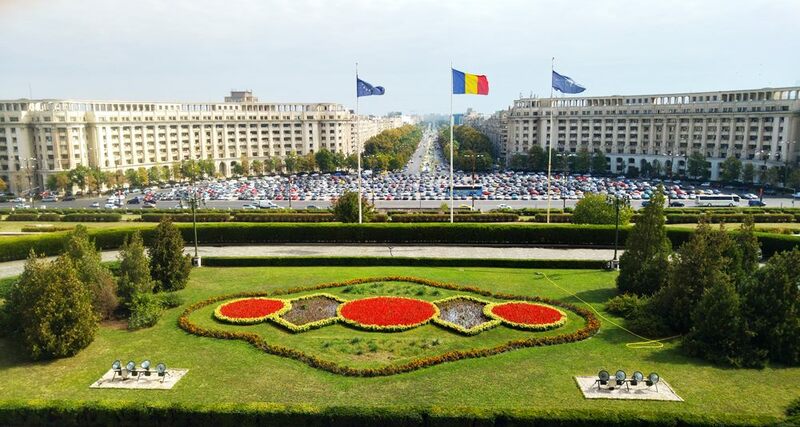 Bucharest is not the most beautiful city to have a panorama of, but it’s still extremely impressive. Unfortunately, because of the upcoming NATO summit, we were not allowed to take this tour. Prices vary from 35 lei (about 8 EUR) per person for the standard tour and go up to 55 lei (12 EUR) for the longest tour. There’s also a 30 lei tax for those who want to take photos with a camera (but photos with your phone are free of charge). 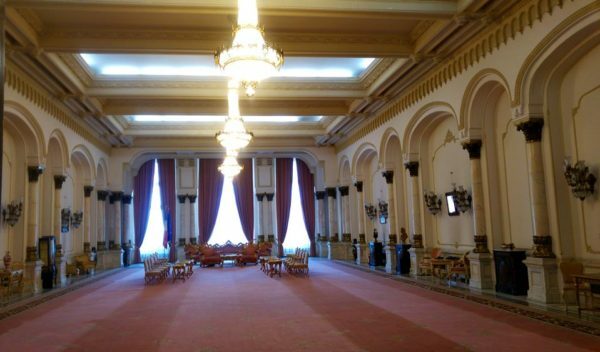 You can find more about the tours, schedules and most importantly the phone numbers to call to make a reservation on the official website of the Palace of Parliament. Kemkem and Federico also ate some other traditional Romanian food – the Sarmale & Mamaliga which looked and smelled very good – and they both said they were delicious. I, of course, forgot to take a photo of the food, so you’ll have to take my word on it. Even better, we’ve visited a couple more great places during their stay – including the beautiful Peles Caste – but we’ll talk about it in an upcoming article. Previous articleWhen Will Romania Switch to Euro? Great pictures Calin, very much different to the ones I took from a distance in the very early 90s when you couldn’t get close to it that’s for sure! 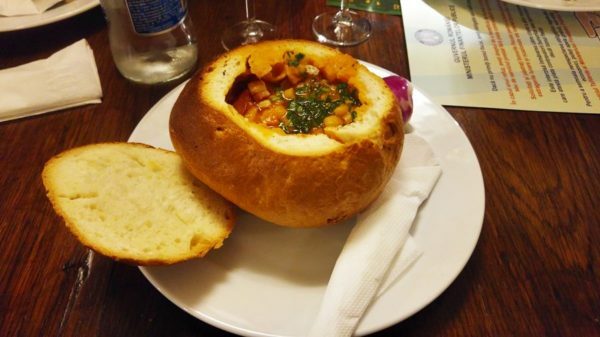 Mmm bean stew in bread, We are in Romania next week and for sure one of our first meals at Hanul Vassy opposite the Gara at Baile Herculane will be exactly this. Will be in DTS during the week too if you fancied a meet for a coffee. I had no idea that Vassy serves this soup in the bread. I remember loving eating there – huge portions and delicious food indeed. I will send you an e-mail shortly! Having read many of KemKem’s comments on this site, I’m glad to learn of her (and Federico’s) blog. I will certainly check it out. Even though I am an artist and third-rate musician, I wish I had the skill of writing. Quite envious of those who do. 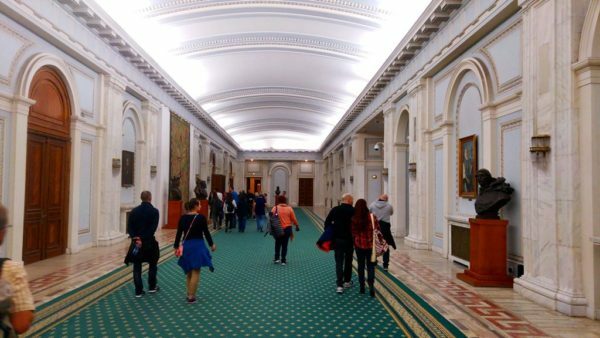 Also, thanks for the tips regarding the Palace of Parliament. 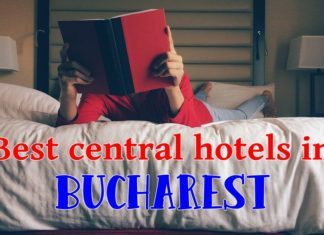 I’m frequently in Bucharest now and have often had the desire to just “pop” in. Now I know better. Already enjoyed Cara’ cu Bere, although I got to experience a power outage while there. All part of its charm. By-the-way, when is it not packed? Jim, I don’t have the skill of writing and I still make it happen. There’s nothing stopping you to give it a try! :)If you’re interested, I can definitely point you in the right direction. Regarding Caru cu Bere… I have no idea. It seems that it’s always packed. Thanks, Calin. I’ll keep it in mind. I am glad you and Kemx2 and hubby had a good time. I am sure Kemkem’s pictures will be even better thanks to that pro camera and the fact that her and her husband also have a lot of background in professional photography. It just boggles the mind how much money was spent on that Palace. I took a tour of it back in the late 1990s. The tour guide proudly described all the luxurious details of the interior trappings. 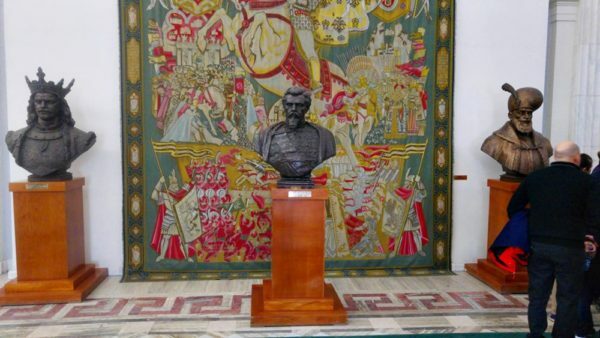 Every area of Romania had supposedly contributed some finery. I remember I got into an argument with a British tourist who proclaimed that Ceasescu’s Bucharest reconstruction efforts were “fantastic.” I could only think of the debts incurred and the hardships the Romanian people had to suffer because of them. I got the same feeling when I saw Neuschwanstein Castle in Bavaria. There, the crazy King Ludwig II bankrupted Bavaria to build a series of fantasy palaces and castles. Today, everyone says King Ludwig was a genius because of all the tourism his buildings have attracted. It’s true, from the pyramids on down, megalomania has given us many constructions that would not have otherwise been built. But I still don’t like it. Now a massive cathedral is being built right next to the Palace of Parliament in Bucharest. No matter how things change, they stay the same! Although I am not religious, I certainly subscribe to the sentiments in that song “Dumnezeu preferă lemnul și spațiile mici!” (“God prefers wood and small spaces,” an allusion to the famous small wooden churches that still exist in Maramures and other places in Romania) That was a controversial song protesting the building of the cathedral to which many Romanian celebrities contributed their voices. It was very moving. There is a YouTube of it. I totally agree, Stuart. And building the mammoth cathedral near the palace… that sounds mostly like a bad joke. It could offer a boost to tourism and look nice in photos, but there are so many other places that are equally – if not more – beautiful without being so huge. The song you’re talking about caused some stir in the media and scandals, resulting in one of the people in the video being removed from it after his fans criticized him for bashing the church. 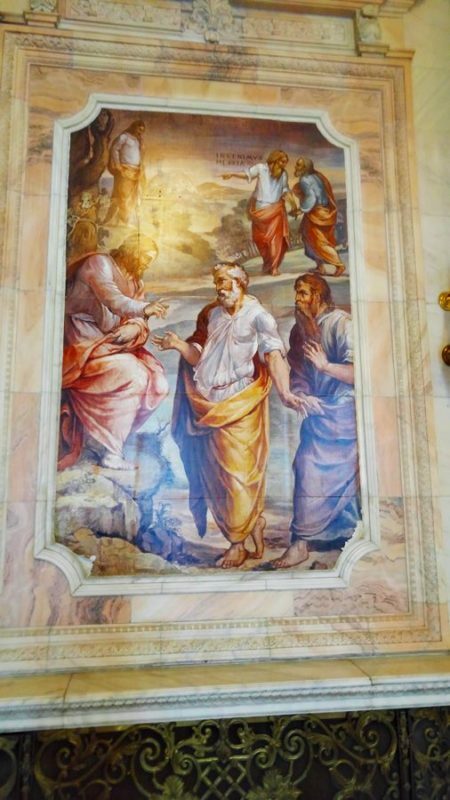 Since his fans were mostly people living in villages, it was understandable, but it’s still sad to realize that, despite all common sense and everything, there are many people who consider building the huge church a good thing. It’s just yesterday that I read an article about a 93-year-old lady living in a poor village, with a pension of 500 lei per month (about 120 Euros) who donated 10,000 lei to the church over the years and does everything she can to save more money in order to donate. One of the thing she does? Eats just once per day in order to keep costs low. This is really sad but paints a better picture of how less educated people have their mind washed by the church. Yes! I googled that article about “Tanti Gherghina.” It’s simply amazing. Her priest praises her as an “example of humility.” What about his church and himself? Aren’t they supposed to be the ones setting examples? Thanks for the update on the “Lemnul” song. I wondered who those celebrities were, they all looked like very interesting people. They radiate talent, goodwill and intelligence, it almost makes you think there is some hope for Romania! OMG! The above story truly infuriates me! I am currently home for my mum’s funeral and the church service was marred by so much begging from the pastors. It was embarrassing. I will save that rant for later. Anyhoo.. C. Thanks so much for taking us around Bucharest. We truly enjoyed time spent with you. I didn’t know it was your birthday, Happy belated one. Nothing makes a trip more special than meeting special people such as you and the Mrs. She is so sweet and we had a blast which made our visit even more special. 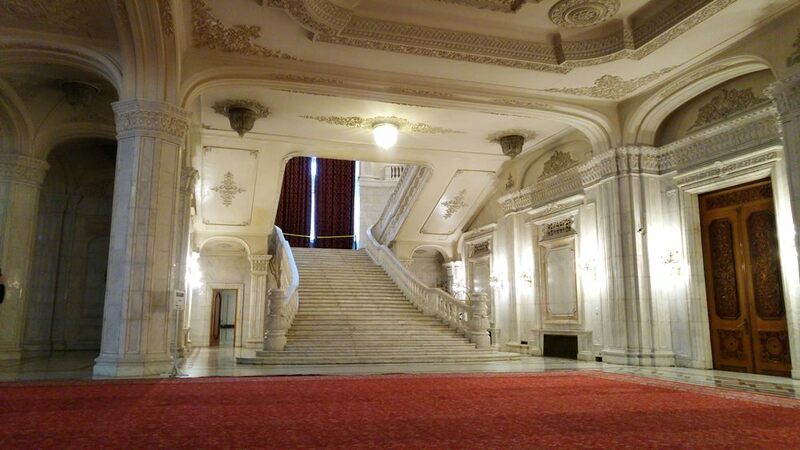 This palace is ginormous and truly if you can’t climb stairs, you have no business going in.. 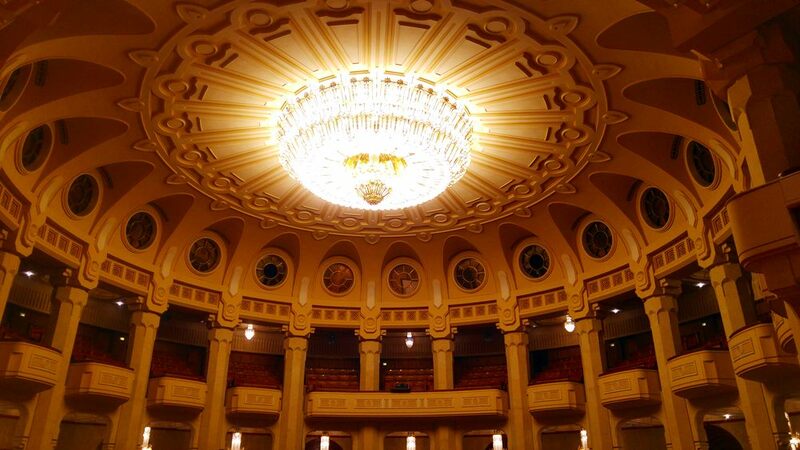 The chandelier alone is worth the price of admission and l agree that it’s a must see in Bucharest. We have been online friends for so long and when Federico asked me how old you were, I was like 27..haha! because you never aged to me. You know we consider you family now (like it or not 🙂 ) and we look forward to seeing you guys again soon, along with the not so small baby :-). Thanks again. I just had lunch but that soup in the bread bowl, I could have it again right now and it’s saying a lot because l just had a whole plate of plantains (my favorite food in the world). But thank you so much for your kind words, they mean a lot to us and I am extremely happy that you liked it here. I am sure that our paths will cross ways in the future as well and I can’t wait to meet you guys again!